Details: monogram set of scarf and gloves. Colours: Black And White. LONG SCARF & MITTENS SET. CLASSIC WOVEN SUPER COMFY & NON-ITCHY AUTUMN/WINTER SCARF. WITH MK LOGO. COMMUNICATION IS KEY SELECTION OF AUTUMN / WINTER ACCESSORIES AVAILABLE TO CHOOSE FROM. WE BELIEVE THIS ENSURES BOTH PARTIES WILL BE SATISFIED WITH THE END RESULT. Fingerless Mittens w/ Cover (Hooded Mittens). 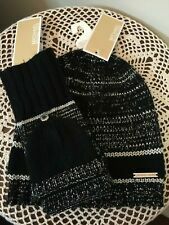 From Michael - Michael Kors, this hat, and matching scarf, 2 PC set, has a subtle, metallic silver, sparkle, in the black, and gray, chain link, logo print. . Scarf - Approx. 10" wide x 65" long . Hat - One Size . New With Tags - $88.